And then, about nine years ago, my best friend Kate introduced me to an even better version: these Festive Easter Cookies, courtesy of, interestingly enough, How Stuff Works. 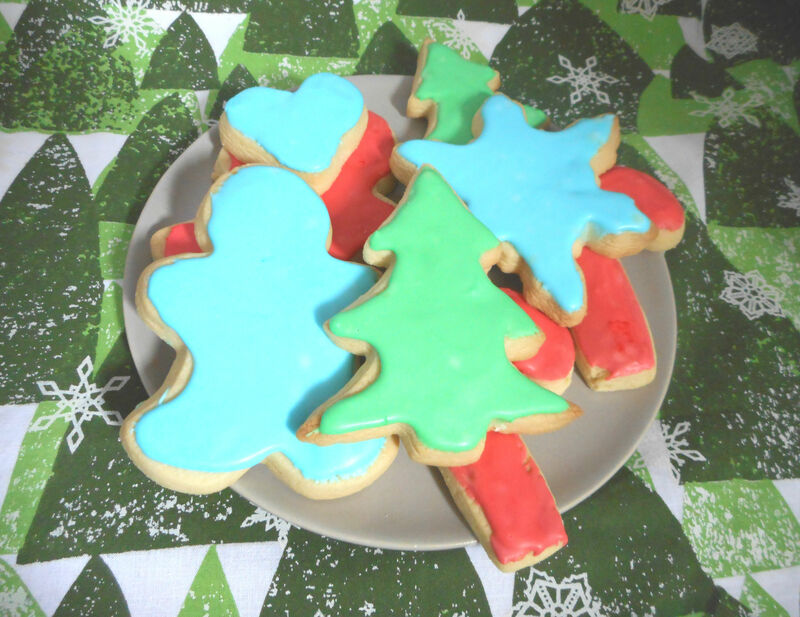 These cookies have all the advantages of the Land O’Lakes version with the difference that they use powdered sugar rather than granulated sugar. As a result, these wonderful cookies have an even finer, smoother texture. Another thing that sets these cookies apart is the lack of leavening, which I think officially makes them butter cookies. Sugar cookies all seem to contain either baking soda or baking powder, but these festive cookies have nothing of the sort. They don’t rise much, they don’t crackle, and they don’t get take on a cakey texture. All that remains is smooth, vanilla, buttery bliss. The shiny royal icing also makes these unique. Buttery, fluffy frosting is wonderful, and you’re certainly welcome to use that on these cookies. But I like that this icing, made with egg white, powdered sugar, and plenty of almond extract to make things interesting, allows the buttery cookies to shine through. You can use vanilla extract if almond isn’t your thing, but I really like the pop of flavor it brings. Since Kate introduced me to these cookies, we’ve made them many times over since then, together and apart. Because she discovered them, we’ve taken to calling them Katemas Cookies–which I realize is probably sacrilegious, so call these what you will. Just don’t call them sugar cookies. They’re so much more than that. Cream together the butter and sugar in a large bowl until light and fluffy. Add egg, vanilla, and salt; mix well. Slowly add in the flour, one cup at a time, stirring after each addition. 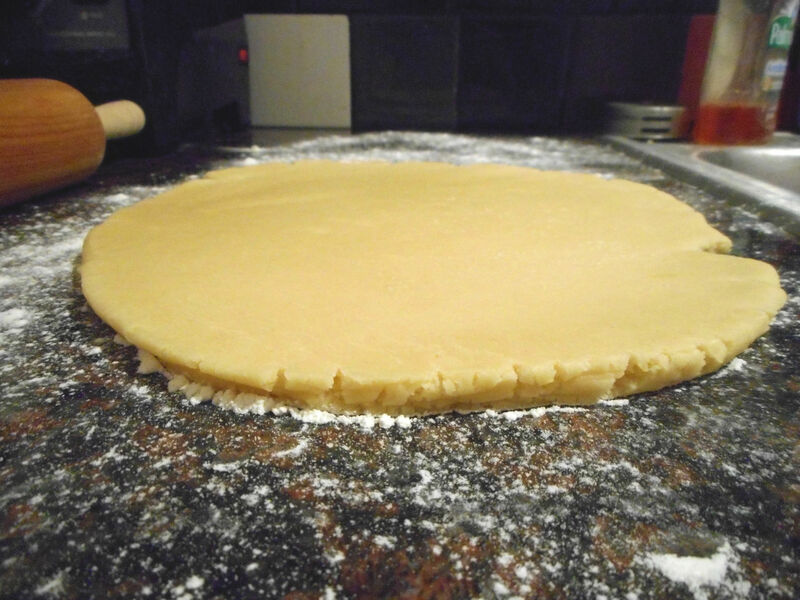 When a dough forms, divide the dough in two and wrap each half in plastic wrap. Refrigerate for 1-3 hours or overnight (1-3 hours is preferable; if refrigerated overnight, it will need some time to warm up before it’s ready for rolling out). Preheat the oven to 375 degrees F. Roll out the dough on a floured surface to a thickness of your preference (1/4″ for thick cookies, or 1/8″ for thin, crispy cookies). 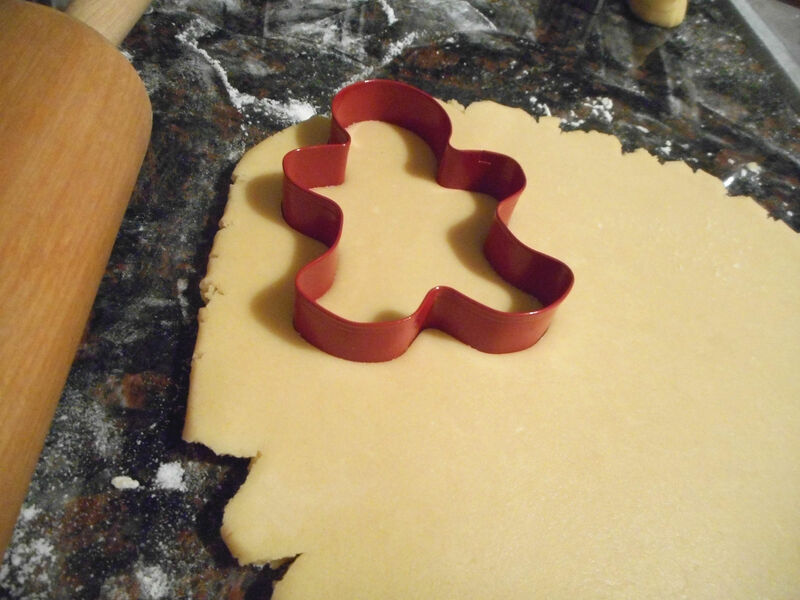 Use cookie cutters to cut out shapes in the dough. Set the cutouts on ungreased cookie sheets and bake for 8-12 minutes or until the edges are lightly browned and the bottoms are golden (this will take longer for thicker cookies–it took mine about 15-18 minutes to reach this stage). Let sit on the cookie sheets for a few minutes before transferring them to a wire rack to cool. 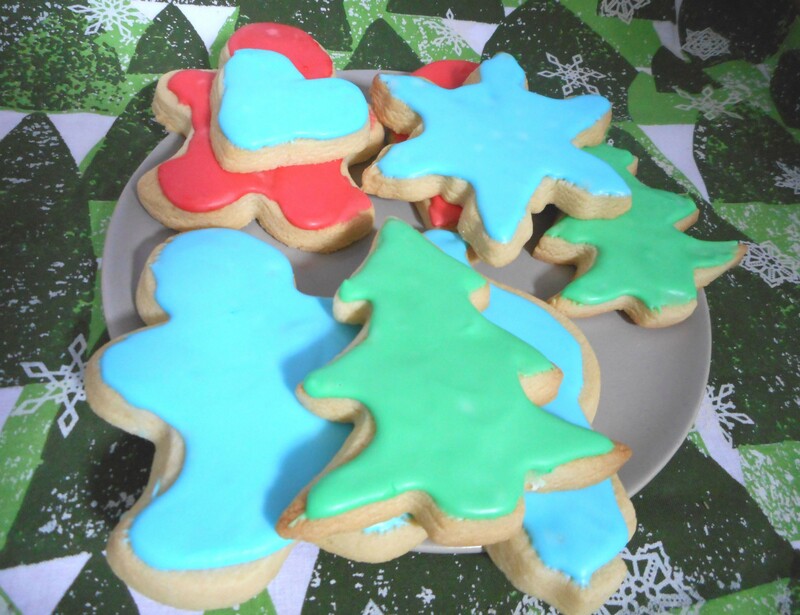 Decorate with Royal Icing (below). 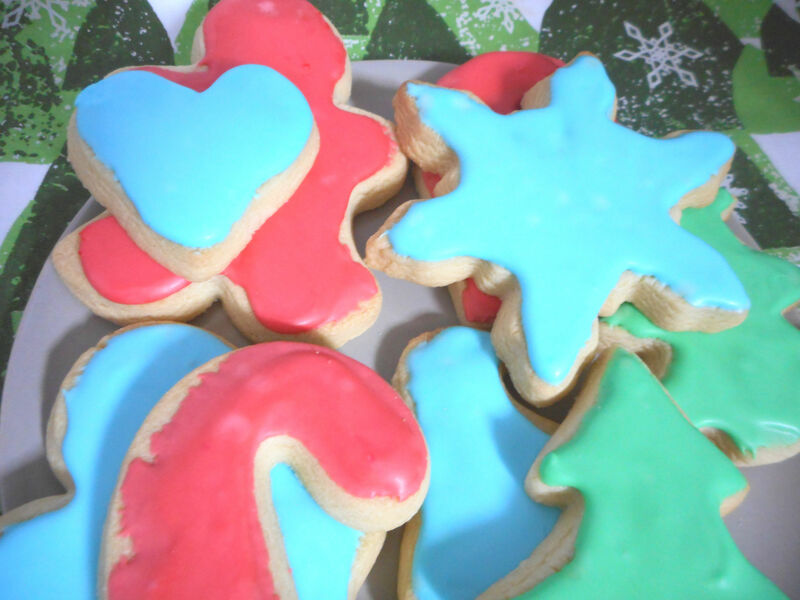 Cookies are ready when the icing is glossy and fully set. Beat the egg white in a small bowl until frothy. Gradually add the powdered sugar, almond extract, and pinch of salt until it is to the taste and texture of your liking. I’m not a big fan of sugar cookies sometimes either so this looks like a good alternative. Yes! I’m glad we’re on the same page about sugar cookies.